H.E. Sir S.W. 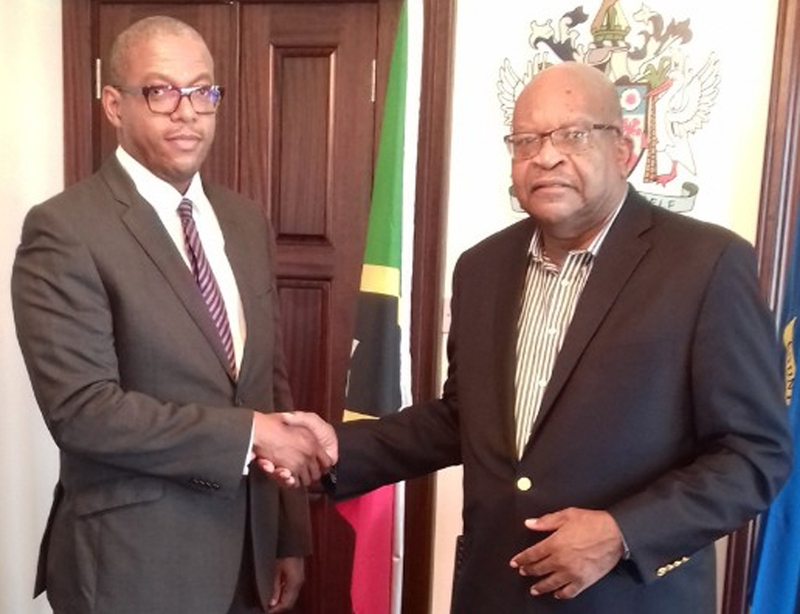 Tapley Seaton, (right) Governor General of St. Kitts and Nevis,administers the Oath of Office and Oath of Allegiance to Hon. Justice Eddy Ventose as a Judge of the Eastern Caribbean Supreme Court. H.E. Sir S.W. Tapley Seaton, Governor General of St. Kitts and Nevis, administered the Oath of Office and Oath of Allegiance on Sept. 3 to Hon. Justice Eddy Ventose as a Judge of the Eastern Caribbean Supreme Court. His Lordship was previously Professor of Law at the Faculty of Law, Cave Hill Barbados and has been assigned to St. Kitts and Nevis. In attendance at the ceremony was High Court Registrar Mrs. Janine Harris-Lake.